The ninth Islay whisky distillery has officially opened its doors for visitors. 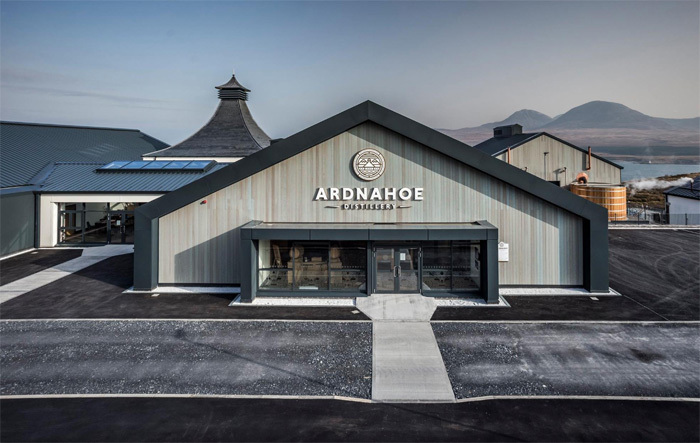 Ardnahoe Distillery was established by Hunter Laing & Co in 2018 and is situated just in between Caol Ila and Bunnahabhain Distillery, on the northeast coast of the island, near Port Askaig. Ardnahoe – Scottish Gaelic for “Height of the Hollow” – uses water from Loch Ardnahoe to distill a peaty spirit that will be rested in mostly ex-bourbon and Oloroso sherry casks. Ardnahoe filled their first cask on November 9th, 2018. Since a spirit has to be aged for at least three years before it may be called ‘whisky, it will take a few years until the first official distillery release will hit the shelves. However, starting this month, the Ardnahoe Visitor Center will host distillery tours, which allows visitors to see (and taste) how the Ardnahoe spirit is created.